Where To Walk When You Travel for Work. One of the big conundrums we walking women face is where to walk when we travel for work. We want to stick with our Self-care basics--moving more throughout the day and a brisk daily walk of at least 25 minutes--but sometimes travel makes that goal a bit more challenging than we’d like. Here’s a few tips to keep you walking no matter where you are! First of all, airports = walking! And sometimes that walking is speed walking pulling a carry-on and throwing in moves worthy of a running back. If that’s not a walking workout then I don’t know what one is. Do not discount the walking you do at the airport just because it’s not your “normal” routine. You’re on your feet and you’re moving--that counts! 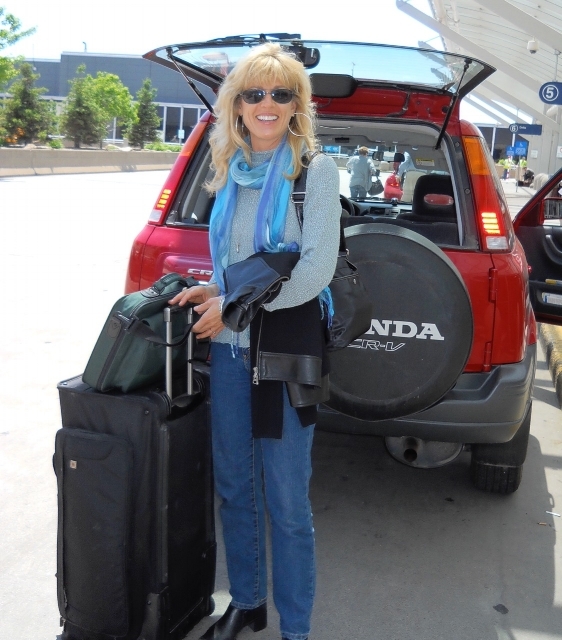 If you have time before your flight or significant layovers during your travel, use those minutes/hours to move more! Many airports have relatively empty concourses and gorgeous art displays. On a recent trip I walked through the Salt Lake City, Reno, and Atlanta airports for a cumulative 8 hours. As a result I got in my walk, I moved more, and I wasn’t too jet-lagged even though one of my flights was a red-eye. Walk at airports and stand when you’re waiting for your flight and, once you’re on the plane, commit to being THAT passenger who gets up and walks every 30 minutes. Remember that after just 30 minutes of sitting, your metabolism has slowed by 90%. You need to get up and move to reset your body, refresh your thinking, and renew your spirit. Is there a park nearby that’s safe for walking? Is there anywhere else nearby that you’d recommend for walking? If the treadmills are working, you have guaranteed walking--that’s the perfect fallback. However, if your schedule allows for it and the front desk was able to recommend some local walking areas, map them out in advance online, pack for the weather, and look forward to seeing some new sights while you’re there. Just make sure that the areas are true walking areas: well lit, accessible, safe, and beautiful! Also, hotels have stairs and halls! Use the stairs more than the elevator and do some extra laps down the hall past your room to get in a bit more walking. These little extra steps add up! In fact, I’ve used hotel stairs and halls as my workout on more than one occasion when the weather was horrible and the gym’s treadmills were all being used. A little creativity and determination go a long way when you’re traveling! My last tip is to make sure you stand and move more throughout your day, even if your day is filled with meetings or day long conferences. Do your best to get up every 30 minutes and walk briskly down the hall and back, to the water fountain, to the ladies room etc. This won’t feel like your normal pattern but make it your normal travel pattern and commit to doing what you can, where you can, when you can. Travel doesn’t have to disrupt your health and wellness if you plan ahead and stay determined and committed to caring for yourSelf every day. Get your walk on when you travel for work and let me know how it goes in the comments here or at One Million Women Walking on Facebook. I can’t wait to walk with you! Newer PostSeen on My Walk: Lake Tahoe!